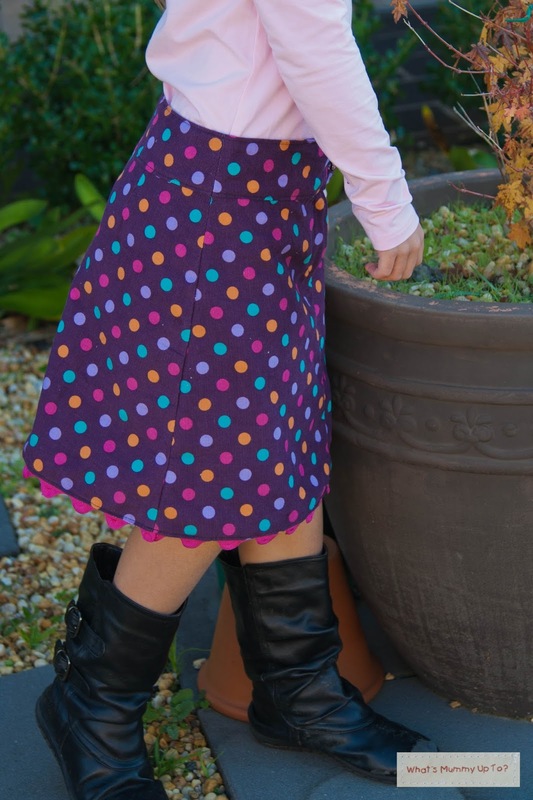 I was lucky enough to be included to test the Nina Skirt and Culottes pattern for girls by the very talented Marte of Compagnie M. She has some great designs, and I felt very honoured to be included to test this new one. This pattern will be available in the Compagnie M pattern shop from 24th June (and there's a discount if you're quick, plus an even better discount if you want the Women's version of the Nina pattern. This is definitely a great pattern to add to the stash. 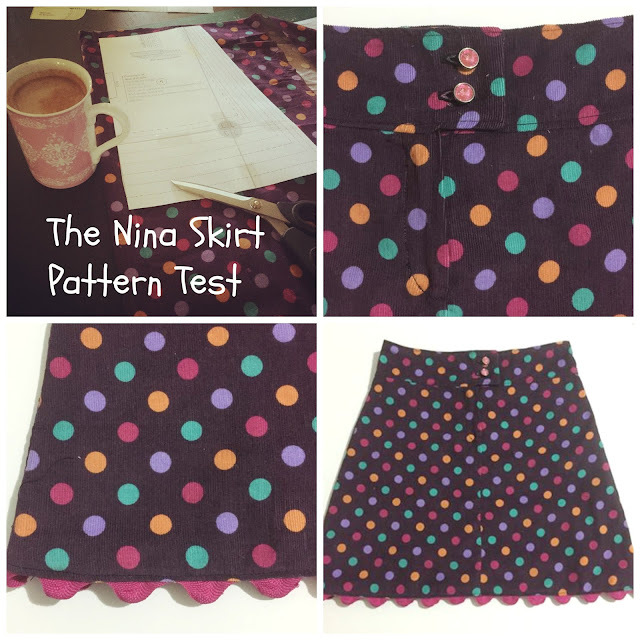 It's very easy to follow, and you can tell this pattern is tried and true ... the amazing Ninas shared by the other testers are so inspiring ... there are some very clever ladies out there! This versatile pattern includes options for an invisible zip or a fly-front zip, and this is for both the skirt and culottes. For the fly-front you can also choose between a large button overlap (like the one I did) or a smaller overlap. So, really there are tonnes of ways to make this one up, and with a different overall look each time. Love a versatile pattern! Anyway, at the time of the testing call, Marte specifically noted that she hadn't seen many fly-front skirt options tested. So I decided that, in my continued effort to cure my zip-phobia, I'd give the fly-front option a go. I'm so happy I did ... for my first ever fly-front I'm so thrilled with how this came out, and I definitely credit that to Marte's pictures along with the instructions. It was very easy to follow, and I was surprised how easily this came together. Given it's winter in Australia currently, I chose to make a winter-weight Nina for Bethany. I had just enough of this gorgeous purple spotty corduroy left from a previous project, and thought this would look great as a Nina. So, I made a cup of coffee and got to cutting. I chose 2 sparkly gemstone buttons, because, well, they're sparkly. Enough said, right! Instead of hemming the skirt as per the instructions, I decided to use a piece of jumbo ric-rac from my stash, to make a kind of scallop-look hemline. This ric-rac was totally meant-to-be. 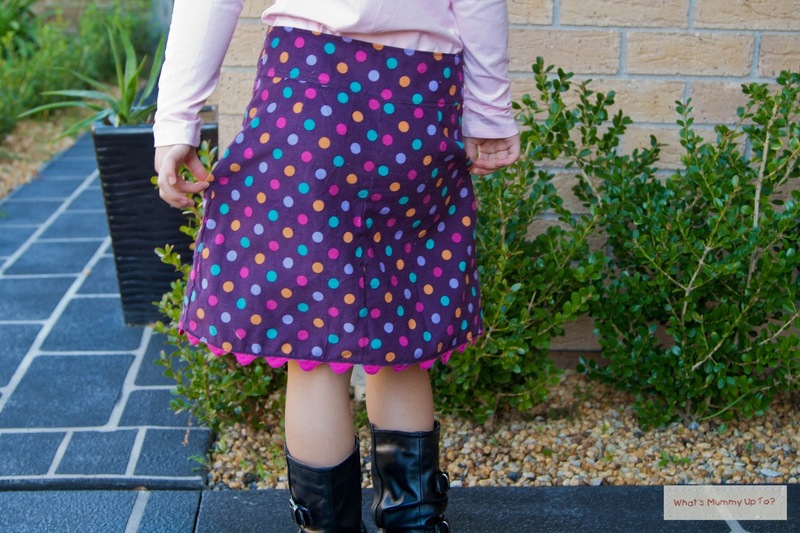 It matched perfectly with the pink spots in the fabric, and the piece I had fit perfectly around the hem. Can't get much closer than that, though I'll admit there was a moment of panic at the half-way mark when I realised I hadn't measured to check it would fit ... whoops, then phew! - Overlocked the raw edge of the skirt hem. - Then, with the ric-rac on the right-side of the fabric, I sewed it along the egde, lining up my stitching with the top edge of the overlocking stitching, and sewing along the middle of the ric-rac. - I then turned the ric-rac under to the wrong side, and topstitched about 1/4" back from the edge on the right-side to hold it in place. Pretty simple and quick, and a nice change to a plain hem. I also liked that it added about an inch to the overall length of the skirt, seeing as this is a winter Nina and all. I made a size 8 for Bethany, and was really happy with the fit. Marte gave a suggestion of adding adjustable elastic to the waist, but given Bethany's measurements I decided not to do this. The fit is great!! So Bethany is happy with her skirt and coupled with a pink top, and her matching pink coat, and some winter boots, this has made a cute outfit for these cold days we've been having. I think my next Nina will be the Culottes ... for Hannah this time! The skirt looks great on your daughter. Congrats on sewing your first zip fly. It really is not as scary as it looks when you have good instructions, right? And yep, sparkly buttons. I hear ya. Gotta have sparkly buttons!! Thanks Jenya. Good instructions absolutely make all the difference. 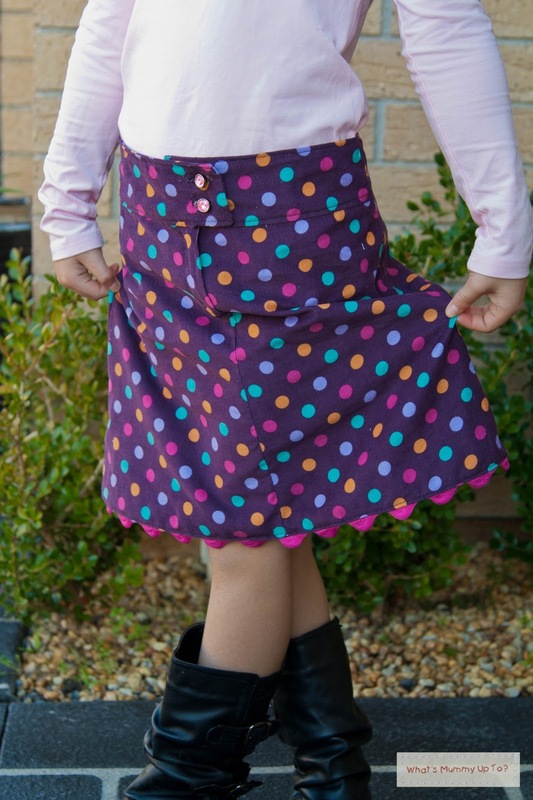 Now to choose some fabric for Hannah's culottes ... And some sparkly buttons of course! Love the fabric you used, and the jumbo ric-rac - going to try that too, thanks for the idea. Thank you Carina. It does make a nice change to a plain hem! Great fabric, great colours and I love the ric-rac hem! Thank you Leentje, I love the colours too!